I came up with the title to this piece before I started typing it. Also, unfortunately, I decided to set forth on a new and magical journalistic mission: to put an article at the top of each of the six CPA article categories: Weekly Articles, Decks, Issues & Rants, Other, Variants, Fiction. Now I find myself in a bit of a conundrum. First of all, I didn't think of this three weeks ago (or whenever it was I wrote the Counter-Column), because I would have submitted that under Variants to fulfill that category. Instead, I submitted it under "Issues and Rants" which is probably the 2nd-easiest category to fill, after "Other" which could mean anything and which I also already used. Okay, I chose Decks. That means I have to make a deck. Which I haven't done in a long, long time. Well, I've done, like, draft decks and limited stuff like that, but not like a serious original constructed deck. Speaking of limited formats, I wonder if Magic Online has reinstated leagues yet. I'm going to go check that now. Hold on a sec. Ugh. 500 updates. I should really log into that more often. But without leagues, what's the point? Anyway, I'll just let that go and get back to my article about a deck that I haven't thought about yet. I suppose the first card should be Fireball. That's a good solid card. I'm sure it's still playable in some format or another. Well look at that. Fireball was reprinted in Magic 2012. That wasn't so long ago. I forget exactly how the year thing works now, since, IIRC, the core sets usually come out over the summer. I see that they're up to Magic 2014, which probably means Magic 2012 came out in 2011, which, of course, makes perfect sense to everyone. It also means that Fireball is no longer legal in Standard, but it is legal in Modern. And Extended, if that still exists. And Classic and Legacy and Type II and Sub-Standard and Post-Modern. That gives me a wide variety of cards to add to this deck to make it playable. But first, I'm going to check on the progress of my updates. Good, they're done. Why did I want to log in to MTGO again? Hold on a sec while I scroll up. Hmmmm... I seem to have forgotten my password. If anyone out there is familiar with how to exploit the Heartbleed virus and happened to use that exploitation to steal my Magic Online password, can you please send it to me? Also, please don't sell all my online cards before doing so. Thanks. Back to the deck. We'll need a way to cast Fireball, am I right? So let's add a Mountain. What the hill is that? It looks like someone was playing with a magnet and iron filings. Don't mountains look like mountains anymore? That's clearly a valley. It's nice that mountains were included in this image, but the focus of the art is clearly on the land between the mountains. And that's just a weird rock formation. I wonder is that's supposed to be a mountain in the background, all covered in clouds there. There. Now that there's a mountain. A mountain worthy of being included in my Fireball deck. In fact, I should probably add a second Mountain to ensure that I have the red mana I need to cast Fireball. Also, to allow Fireball to unleash damage instead of just being cast. Classic. Isn't it nice that ALL of the mountains from the original sets actually looked like Mountains? Oh, I just remembered my password. Hold on a sec. A NEW VERSION! Gah! Why can't they just make the current version work? Haven't we been through this crap already? And now I'm supposed to download a Beta version. Do I get free cards out of it? Bah. No, Magic Online developers, I will not download your new version. I dismiss your message. Goodbye. So how's my deck coming? Let's take a look. Nice. Now where to go from here? I feel like I should add some new card, to show the young people how hip I am. But I don't really know any new cards. Let's take a look shall we? Is Born of the Gods the latest set? That's what I'm looking at now. Oooo... I just saw a card image gallery for "Journey into Nyx" whatever that means. I'll use one of those cards. Wow, this is painful to look at. Can someone explain to me the difference between Strive and Multi-kicker? Multi-kicker's a thing, right? I'm pretty sure I didn't make it up right now. I get that Strive is really just copying the function of the spell, but can't Multi-kicker do that already? I'm sorry I fail to see how this added anything to the game. I may need to start a campaign to eliminate the wasteful WotC spending of new keywords. Dear people: you don't NEED five new keyword abilities with every new block! If you think of a good one, then go ahead with it, but if you think of one that already does the same thing as an existing keyword but doesn't do as much, just use the old keyword. Did Horsemanship teach us nothing? Oh no! I'm ranting. Gotta stay on message here. 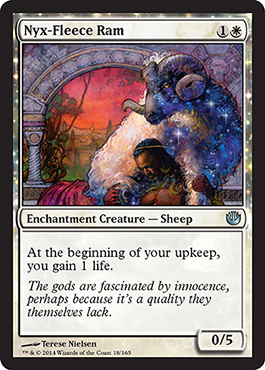 To avoid looking at more of these cards, I'm going to add Nyx-Fleece Ram to my deck. That seems like a nice card. It's pretty. It's a sheep. It's got a sparkly border, which I'm sure means something. It's an enchantment. Wait, what? Oh. It's an enchantment creature. That makes sense. Lucent Liminid seems to have spawned an entire family of cards. And they all get sparkly borders. Sparkles for everyone! Yay! Oh crap. I forgot to check if leagues are up on Magic Online yet. Hold on a sec. "10:48 PM [sSET PRM R]We will be reintroducing Leagues after a number of ongoing infrastructure projects are completed." Wow. This is the exact same message they've had up for the last six years. How many freaking infrastructure projects do they have going on? I guess one such project was completely getting rid of all infrastructure and starting over from scratch. Screw this. Back to the deck. I should probably put in a source of white mana to cast the Nyx-Fleece Ram. And since I’m already playing red, I will choose a dual land (not to be confused with a duel land, which is really any land played during a two-player game). I’m sure there have been plenty of quality red-white lands printed recently, but I don’t know any of their names. So, I’m going to head over to Gatherer and enter “Mountain Plains” and search by card type. So it’s either Plataue... no... Platuea... no... Plataeu... um... Plaaa-toe (you know what I mean) or Sacred Foundry. To keep things Modern-legal I’ll choose the latter. Also, Plateau (got it!) is a really good card and we don’t want this deck to get TOO overpowered. Good then. Okay. So, like, the point of the deck is that the sheep gains life every turn until you’ve accumulated the mana to cast Fireball for two damage. But the deck has one weakness: it lacks enough cards to draw a full hand to start the game, thereby ensuring you’ll be decked before your first turn. This is something I need to work on. Oh! I just thought of something! OMGOMGOMGOMGOMG! What if the NEW version of Magic Online that they were trying to peddle on me a moment ago DOES have leagues? Hold on, I gotta check this out. While I’m waiting on that, let’s look on fixing that earlier problem I identified in this deck I’m building. The troubling part right now is thinking of more red and white cards to add. I don’t know if I can reach the seven cards necessary to draw an opening hand without diving into another color. I heard one time that blue is good, so let’s add blue to the deck. I’m going to go with an Island to support all the awesome blue cards that are going in. And then I’ll add Lightning Angel, since you can’t have a red, white, and blue deck without Lightning Angel. I’m wondering if Lightning Angel is legal in Modern. We’ll use the time-shifted version just to be on the safe side. Oh, my download’s done. Hold on while I check it out. My head hurts. I don’t want to complain too much, lest I’m forced to file this under a different category, but that was the most non-intuitive MTGO interface yet. The nice thing is that the HELP button is clearly labeled at the top of the screen. I’m sure there’s some helpful information to be found somewhere in the help menu, but I’m not feeling like looking for it right now. I’m probably definitely going to get back to this later maybe. Next time: 53 more cards! Read More Articles by Eric Turgeon!